This mod is a personal favorite for our staff team. 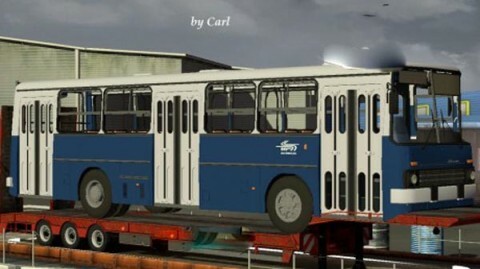 It will introduce a flatbed trailer with a Ikarus 260 bus onto. Furthermore, this trailer wins our respect because it is in BKV Budapest colors. This trailer has different downloads that will change its mirrors. This mod has been tested on the most current version of the game. Our team did report that at times the game did become a bit leggy. However, the issue quickly ended and only occurred once in a while. No problems were reported on older versions of the game. Current time: 04-20-2019, 01:23 AM Powered By MyBB 1.8.20, © 2002-2019 MyBB Group.